Templeton is a beautiful place to work and live, but it can be a tough place to do landscaping and yard work. Hot summers, cold winters, hard soil, and ongoing water issues are all challenges you face. Let us do the work for you! Having been based in Templeton for many years, we have the knowledge and expertise to make sure your landscape will flourish in these conditions. You’ve surely noticed that a lot of your friends and neighbors are removing their lawns and changing their landscapes to use less water. 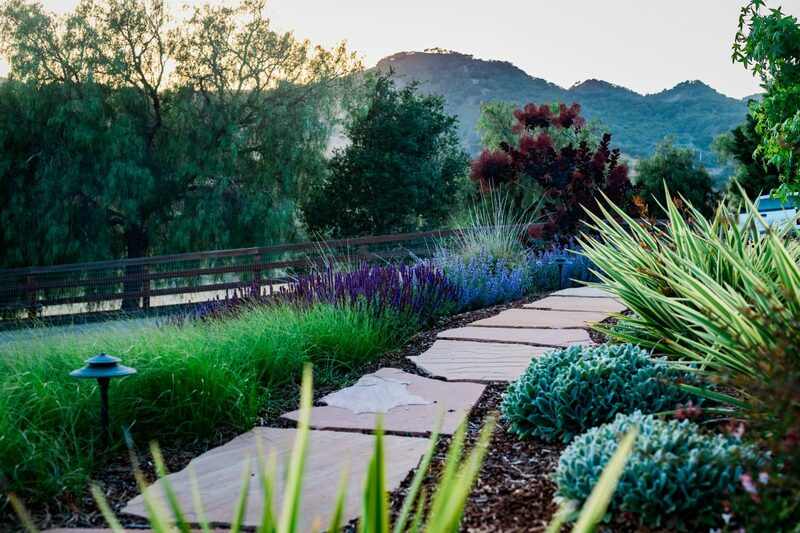 Wild Bloom specializes in designing and installing drought-tolerant landscapes. Through careful plant selection, sustainable design, and low water irrigation systems, we will reduce your landscapes’ water usage and lower your water bill. Drought-tolerant landscapes aren’t just cacti and rocks either. Our region is fortunate to have a huge assortment of native and well adapted plants that thrive on very little water, so your landscape can be as unique and attractive as it is functional. We serve clients throughout Templeton, from in and around town to the Highway 46 and Vineyard Drive areas. Whether you are a homeowner, business owner, or need landscaping for your winery, contact us to learn how we can help. Want to Learn More about Drought-Tolerant Landscaping? Click here to read our guide to lawn removal rebates. Click here and here to read our articles in the Paso Robles Daily News. I have a large property that I wanted to renovate and a friend recommended Wild Bloom. They did an excellent job throughout the whole process from the design to the actual installation. The new landscape has a very nice natural look with steps and a walkway going from the driveway to my house. They even interspersed fruit trees in the landscape so I will have fresh fruit in the summer.